Other Names: "The Nature Boy"
- Mid-South Superdome Extravaganza (July 4, '81) = Landel fell to Ken Mantell. - Mid-South Superdome Extravaganza (May 1, '82) = Landel wrestled to a Draw with Jesse Barr. - Mid-South Last Stampede (April 7, '84) = Landel beat Lanny Poffo. - Mid-South Television Title Tournament (April '84) = Landel lost in the first round to Terry Taylor. Krusher Khruschev won the tournament. - Mid-South Superdome Extravaganza (June 16, '84) = Landel took down Sonny King. 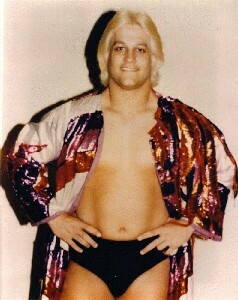 - NWA Starrcade '85 (July 6) = Landel wrestled to a Draw with Ron Bass. - NWA Starrcade '85 (November 28) = Landel won the National Championship from Terry Taylor. - NWA Southern Tag-Team Title Tournament (January 13, '86) = Landel & Dutch Mantell fell in the first round to the eventual winners, the Fantastics. - NWA Crockett Cup '86 (April 19) = Landel & Bill Dundee were taken down by Steve Williams & Terry Taylor in the 1st round. The Road Warriors won the Cup. - NWA/AWA Southern Heavyweight Title Tournament (June 16, '86) = Landel beat Don Bass and Roger Smith to win the tournament. - UWF/PWI Tournament (October/December '86) = Landel fell in the first round to Terry Taylor. Steve Williams won the tournament. - Mid-South Superdome Extravaganza (November 27, '86) = Landel lost, via forfeit, to the UWF Television Champion, Savanah Jack. - WWC 15th Annual Show (December 10, '88) = Landel took down TNT. - CWA Tag-Team Title Tournament (March 13, '89) = Landel & Tommy Rich lost in the first round to Jeff Jarrett & Jimmy Valiant. Tracey Smothers & John Paul won the tournament. - USWA Heavyweight Title Tournament (October 2, '89) = Landel fell in the first round to Dutch Mantell. The Dirty White Boy won the tournament. - USWA Tag-Team Title Tournament (December 1, '89) = Landel & PY Chu-Hi lost in the first round to Dustin Rhodes & Jimmy Jack Funk. Robert Fuller & Brian Lee won the tournament. - WCW Clash of the Champions XII (September 5, '90) = Landel was pinned by Mike Rotunda. - WCW Clash of the Champions XIII (November 20, '90) = Landel was beaten by Brian Pillman. - WCW at the Omni (February 17, '91) = Landel, Dutch Mantell, & Dr. X were taken down by Tommy Rich, Ricky Morton, & the Junkyard Dog, who won the WCW Six-Man Tag-Team Titles. - WCW Wrestle War '91 (February 24) = Landel fell to Dustin Rhodes. - SMW Volunteer Slam '92 (May 22) = Landel was beaten by Brian Lee. - SMW Fire On The Mountain '92 (August 8) = Landel lost an "I Quit" Match to Tim Horner. - USWA Heavyweight Title Tournament (October 3, '94) = Landel defeated John Kronus and Perry Saturn, then lost in the finals to Tommy Rich. - SMW Princeton Show (December 5, '94) = Landel beat Steve Skyfire, then pinned Brian Lee to win the SMW Television Title. - SMW Super Saturday Night Fever (January 28, '95) = Landel won over Tracey Smothers. - SMW Sunday Bloody Sunday (February 26, '95) = Landel was beaten by Bobby Blaze. - SMW Bluegrass Brawl '95 (April 7) = Landel fought to a Draw with Bobby Blaze. - SMW Fright Night (April 8, '95) = Landel won the SMW World Title from Bobby Blaze. - SMW Volunteer Slam '95 (May 19) = Landel lost, via DQ, to Steve Armstrong. - SMW Summerblast (July 15, '95) = Landel lost, via DQ, to Brad Armstrong. - SMW Superbowl of Wrestling (August 4, '95) = Landel fell to the WWF Intercontinental Champion, Shawn Michaels. - SMW Fire on the Mountain '95 (August 12) = Landel lost to Brad Armstrong, who won the vacated SMW World Title. - SMW Halloween Scream (October 20, '95) = Landel lost a "Chain" Match to Tommy Rich. - SMW Thanksgiving Thunder '95 (November 23) = Landel & the Bullet defeated Tommy Rich & the Punisher. - OVW Christmas Chaos (January 31, '01) = Landel, Sean Casey, & Chris Michaels fell to Derrick King, Rip Rogers, & Jason Lee. Due to prematch stipulations, Phil Phair had to kiss the winners' backsides. - Memphis Night of Legends (June 15, '01) = Landel & Billy Travis were beaten by Jimmy Valiant & Rocky Johnson.